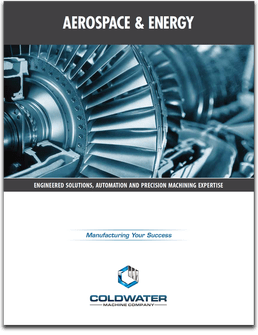 Coldwater Machine Company, a leading engineered solutions company with large part machining expertise, announced that it has released a new eight page, full-color brochure presenting the company’s design to print, tooling and special machine capability for the aerospace and energy industries. The brochure features high-quality photography throughout the brochure and focused on the company’s turbine-based engine, assembly, machining and repair experience. Information is included on the company’s certification, precision machining specifications as well as examples of real-world customer examples illustrating Coldwater’s inventive approach to overcoming manufacturing challenges.